We’ve looked through the Tassomai data, and found some of the topics that our students find the hardest! We’re posting brief explainers on each of these topics over the next few weeks in the run up to exam season. Give this series a read if you, your child or your students are struggling with any part of Tassomai - even if these particular topics aren’t problematic, we’ll also touch on some common errors students make when answering questions on Tassomai! Students often struggle with questions about biodiversity - specifically why we think maintaining biodiversity is important and how we maintain it. Biodiversity is the variety of different species within the ecosystem being described. An ecosystem containing many different species, like a rainforest, is more biodiverse than one with a few species in it, such as a desert. The populations of individual species isn’t what determines the level of biodiversity, it’s the number of distinct species. What is important to remember is that the ecosystem which is being referred to can be any size; it could even be the entire Earth. In addition to this it can refer to the number of different ecosystems within one area or the genetic variation within one species - both of these will mean there are more species within the ecosystem described. In any ecosystem, if the number of one species changes, then this will have knock-on effects. For example, if the number of rabbits in the woods were to decrease, then the number of foxes would also drop - this is because foxes eat rabbits, and there would be less available food. If an ecosystem is very biodiverse, then a change in one species will have a smaller effect on other species. This is because they will have other food sources which haven’t changed. This doesn’t just matter for food, but also for shelter. Human activity is causing more pollution, and this is leading to species going extinct - decreasing biodiversity. Therefore maintaining biodiversity helps us to conserve animal species which may otherwise be in danger of going extinct. We do not try to maintain biodiversity in order to generate resources or profit - although this can be an unintended benefit, as areas of high biodiversity are often beautiful, and therefore generate income through ecotourism. How do we maintain biodiversity? 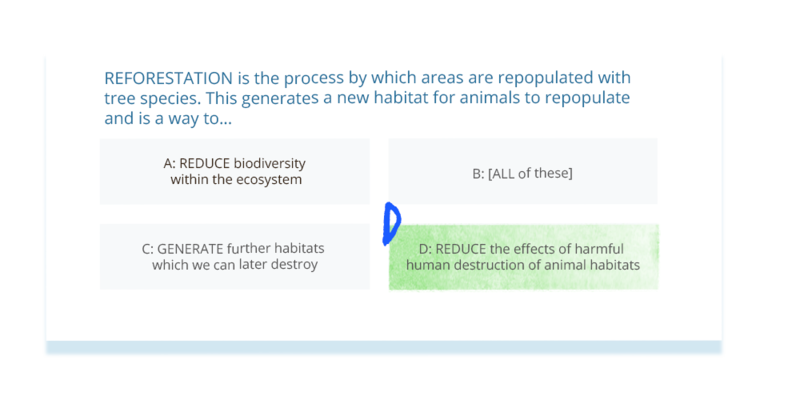 This regenerates animal habitats that have previously been destroyed which allows us to conserve and/or increase biodiversity in these areas. These forests also have the benefit of reducing atmospheric carbon dioxide levels through photosynthesis. In addition to this, we try to maintain biodiversity by implementing breeding programmes for endangered animals. These are animals which we think may go extinct due to human activity, and breeding programmes are a way to prevent this. Rare habitats are often “protected” - this means that any activity which may damage these ecosystems is prohibited by law. This prevents these habitats from being destroyed for profit. One final mechanism which is used is by introducing field margins and hedgerows in areas where farmers only grow one crop. Because these farms only grow one crop, they have very low biodiversity. By introducing field margins there are limits to how large each field can be, and the hedgerows which divide them increase biodiversity - the hedge is a new species, and provides habitats for more species to live in. Lots of our students choose “All of these” here - students often just assume that all of these is always the correct answer and click it without reading the question. Make sure you always check all the answers are actually true - this definitely isn’t the case here! 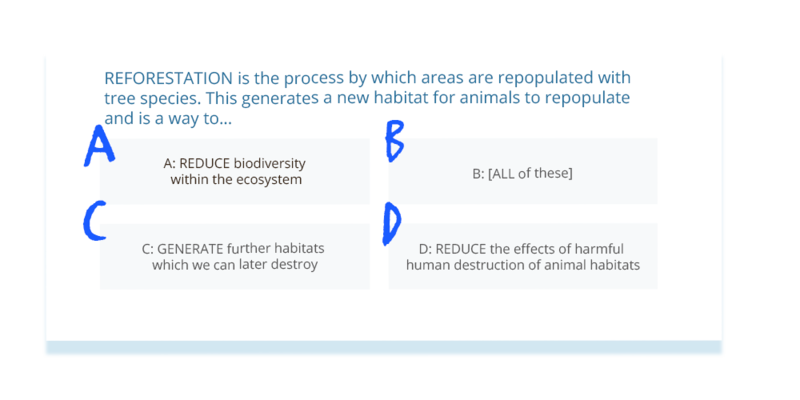 We know that the correct answer is not A, as reforestation is not a way to reduce biodiversity, but instead to increase it - and this means it cannot be B either. Similarly, these habitats aren’t being generated to be destroyed but to replace trees which have already been destroyed. It is a way of undoing the damage we have already done, and we therefore know it isn’t C.
Instead, we know that it is D because we are trying to reduce the harmful effects of human activity on the environment.